As an urban planner with a national practice I am frequently asked by friends and colleagues for an opinion on the Interstate 77 toll lane discussion. I’ve been all across the country this past year in areas that were either growing fast or dying slowly. So when I return home to see how a seemingly conservative group of advocates demand spending more than a half billion dollars on a single-purpose facility, I not only wonder if that is the answer, but I wonder whether anyone is asking the right question. The question seems to be only this: How fast can we widen I-77? And the foregone conclusion to solving all our transportation woes from uptown Charlotte to Statesville is to run out to the highway store, after eating our way through the holiday season, and buy a pair of fat pants and a bigger belt. Instead, the question should be: How do we facilitate more predictable and reliable mobility, north to south? And, assuming that a half-billion dollars were miraculously sitting on the table to spend, why would we dump it into one project? Folks, I hate to break it to you, but there is no highway wide enough to accommodate growth’s demands. Transportation researchers have already proven that the inconvenient truth of “induced demand” will sap any capacity in any additional lanes within a generation. Induced demand is a well-proven, if counterintuitive, result. Highway widening will increase demand (congestion) for the capacity rather than relieve it. Very simply, for some short period of time, homebuyers will be lulled into a false sense of smooth sailing until sometime in the near future the new road capacity fills back up. The 23-lane, Interstate 10 corridor in Houston, which combines free lanes (a lot of them) and managed (toll) lanes (a lot of them, too), saw total commute times (morning and evening) increase by more than 32 minutes from 2011 to today. Are we Houston? Not yet. But with a growth projection that our metropolitan area will double in population in the next 40 years, we’ll be Houston before we know it. So, when asked – “Do I support the toll lanes?” – my response is yes, but it’s but one of many solutions needed. The lesson from Texas – a hyperconservative, pro-property rights state, where managed lanes are now everywhere – is that adding free lanes is the functional equivalent of throwing money down a rat hole. At least with toll lanes, they can manage the trip through demand-based pricing strategies that keep cars and their occupants flowing. In that regard, that is the only type of new freeway lane that makes any sense in Charlotte. 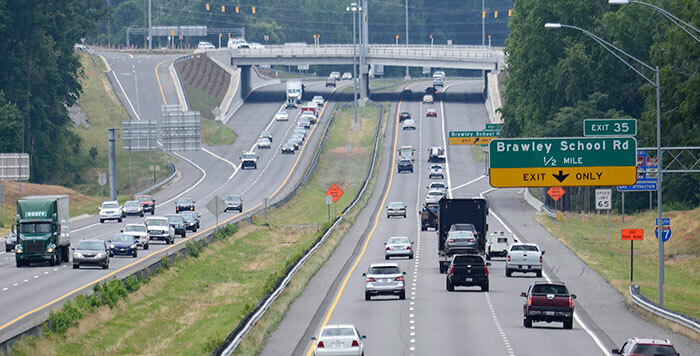 To offer additional free lanes – lanes that our already heavily subsidized state Department of Transportation cannot afford – would simply open new land for development farther out, causing it to fill with the aforementioned “induced demand.” Has Interstate 485 really relieved congestion? Have you been around the southwestern leg with its 6+ lanes at 6 pm lately? We simply need more choices, and choices not predicated on accommodating single-occupancy vehicles on single-purpose freeways. Until we all move over to Smart Car-sized autonomous cars, freeways are a lost cause for improving travel times. Instead, we need to look at providing more choices in our corridors – choices in both the network and the mode. The Charlotte region’s suburban development pattern has failed to provide choice to our community. Its heavy reliance on dendritic neighborhood patterns and poorly connected thoroughfares means we have no traffic on the cul-de-sac while we have terrible traffic on the periphery. Look at a congestion map of Mecklenburg County. The worst congestion begins about 15 miles from the center city, where the number of choices in the street network decreases dramatically. While long-haul commuters won’t necessarily take the smaller streets to travel 30 miles from office to home, folks who simply need to take their children to soccer practice at 5:30 p.m. (my family included) have few choices for our short trips. Two two-lane roads handle more traffic than one four-lane road. How many two-lane roads, north to south, can we build for a half a billion dollars? After all, isn’t choice a good thing? As Americans, we like many choices when we go to Target to buy a vacuum cleaner. Have you seen the dog food aisle at Harris Teeter lately? Yet, for the single piece of infrastructure that has the greatest impact on our productivity, our air quality, and our economic competitiveness, we have few choices. This leads me to the elephant in the room –transit. Dedicated-corridor transit is the only mobility solution that can ensure consistent travel times from point to point regardless of demand. If the cars fill up, we can simply add more cars. Having traveled to Dallas this spring, I saw how a 20-year investment in transit has paid off for the Metroplex. With 90 miles of light rail infrastructure and 62 stations, the DART system accommodates nearly 100,000 passenger trips every day. That’s about the same volume as I-77 carries today. Most important, the system, the largest light rail system in the country (again, in Texas), has ensured that Dallas can remain competitive in the marketplace for jobs. State Farm is finishing construction of a $1.5 billion, 2 million square-foot office space within a stone’s throw of the light rail station in the northern suburb of Richardson. They are doing the same for their operations in Atlanta and Tempe, Ariz. Why? Because it gives their employees more reliable choices to get to the office. Anyone know what the annual property taxes are on $1.5 billion? Until the Charlotte region and our partners in Raleigh and Washington get serious about funding transit, we are going to remain a community with few choices. And so long as we keep providing a monoculture of answers to the wrong questions, we will continue to see congestion increase. If I could wave a magic wand and spend a half-billion dollars in the north corridor between Charlotte and southern Iredell County, I would build a commuter rail system (where fares would be less than half of the toll lanes) from Charlotte to Mooresville and have money left over to construct another north-south thoroughfare. Instead, I’m just glad the public investment far less than the total, and the rest is someone else’s money. At least what is getting built will be managed to give us the hope of a predictable travel time. We might not be trying to lose weight through diet and exercise, but at least we aren’t simply putting on our fat pants and giving up. This article is a must read! As is often the case, I agree completely with Jill. She and David Howard are to be commended for their valiant efforts to find new funding streams to pay for our infrastructure needs while keeping our eyes on the role of transit in mobility.